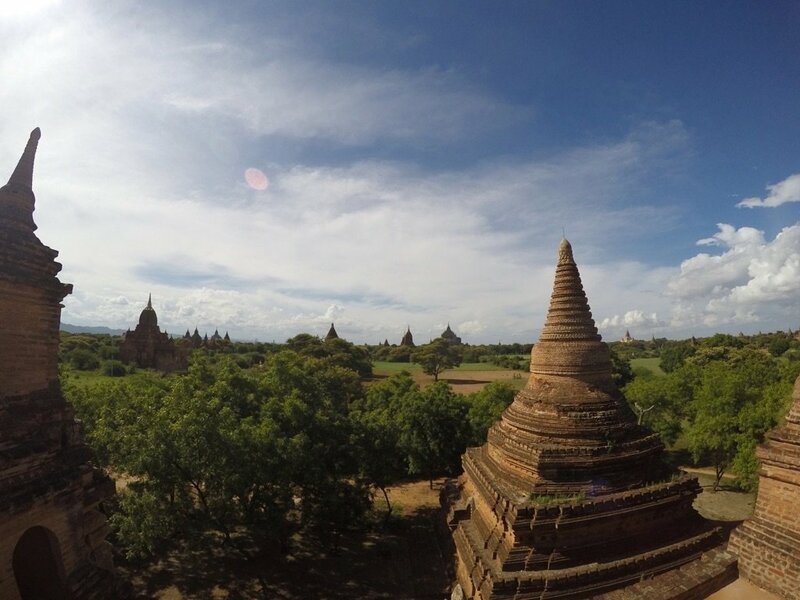 The ancient city of Bagan in Southeast Asia was once home to over 10,000 temples and pagodas. 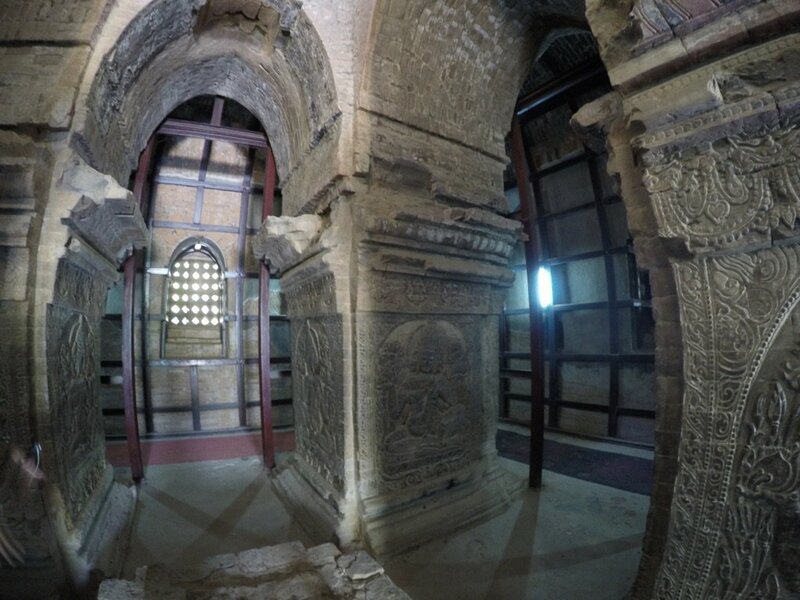 Located in the Mandalay region of central Myanmar, today over 2,200 still stand and are accessible in the Bagan Archaeological Zone. The average visitor only sees a handful of these. With so many to choose from, where should you start? What temples are considered ‘must visits’? 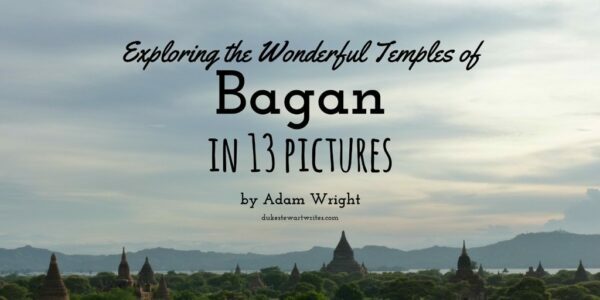 This is by no means an exhaustive list, but a guide to an ideal first day exploring the temples of Bagan. Start the day off with an incredible view and beat the crowds, witnessing a stunning sunrise from the upper terrace of the Lawkaoatsheuong Temple. By no means the tallest or the biggest temple, it benefits from being well preserved and off the beaten track and, of course, also makes a great choice for a sunset. Many people find it locked. However, the caretaker is always nearby ready to open the doors to those with a little patience. 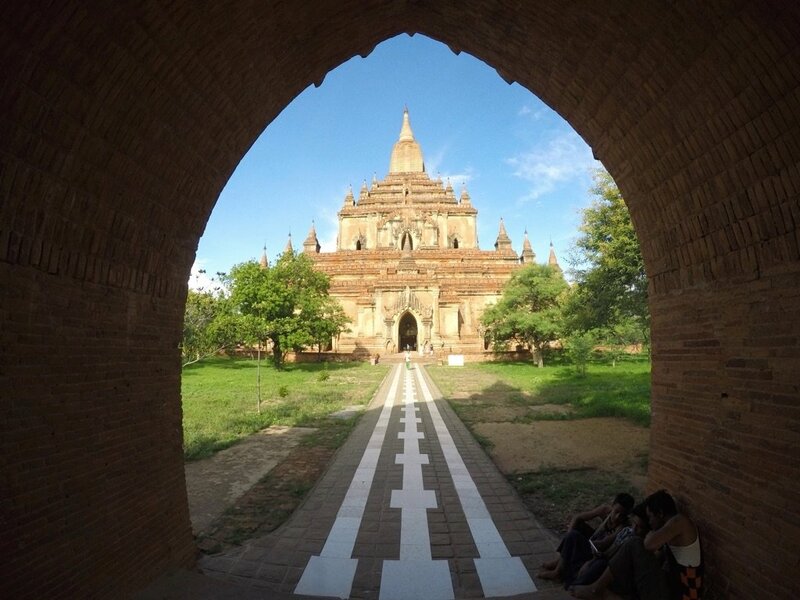 The Ananda Temple is one of the most popular in Bagan, and rightly so. 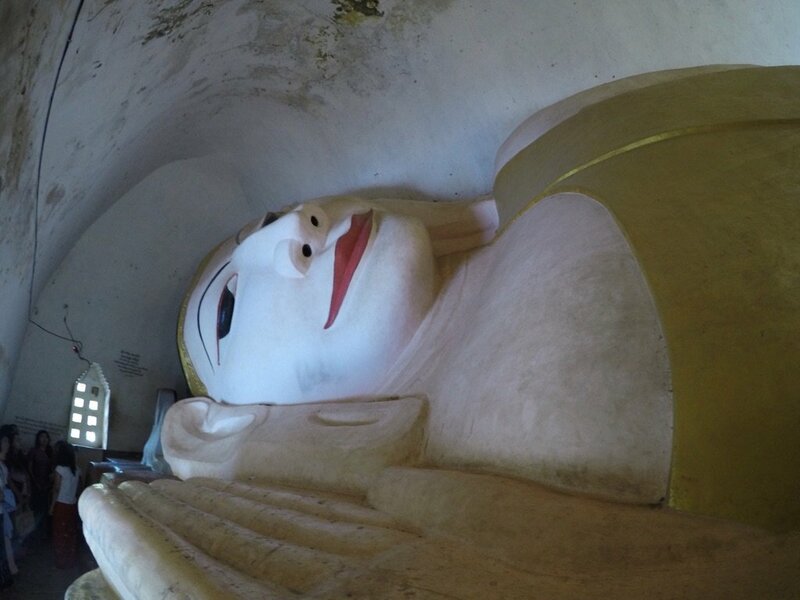 The whitewashed exterior, complete with Chinthe guardians protecting the 9.5m high Buddha statues within, have earned the temple the nickname ‘The Westminster Abbey of Burma’. 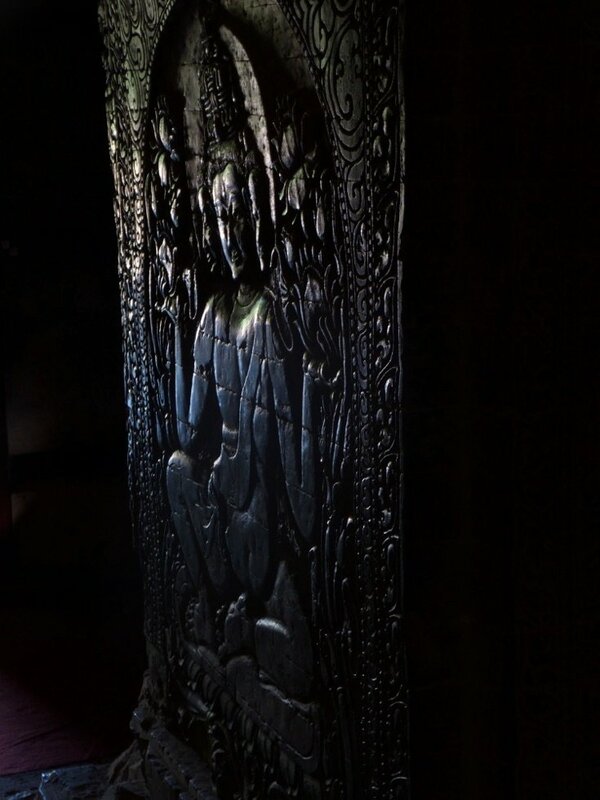 Be sure to witness the optical illusion with the large Buddha statues. Standing close and looking up the face appears have a neutral expression. Move backwards away from the statue and the facial expression moves into a smile! Visit earlier in the day to avoid the crowds and get the place to yourself. 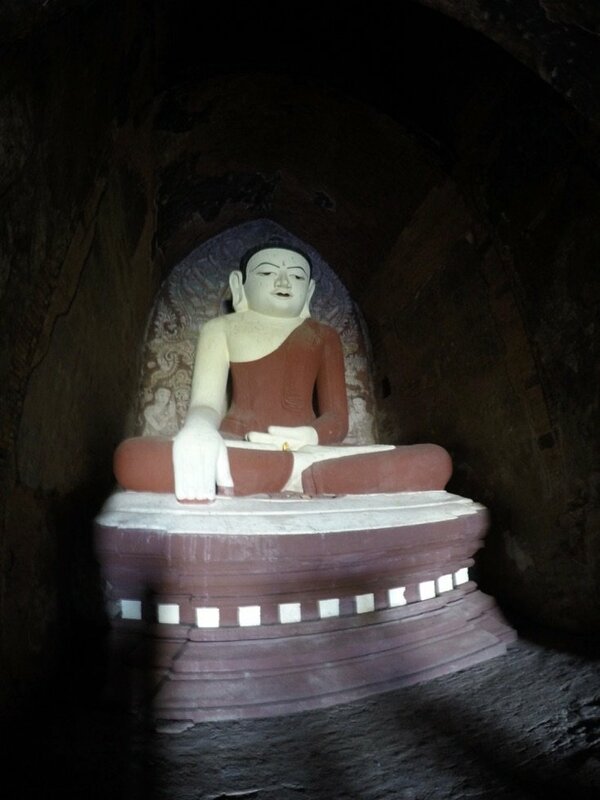 The Sulamani Temple is another one of the more popular Bagan temples. Well preserved and eye catching, resulting in higher numbers of visitors. 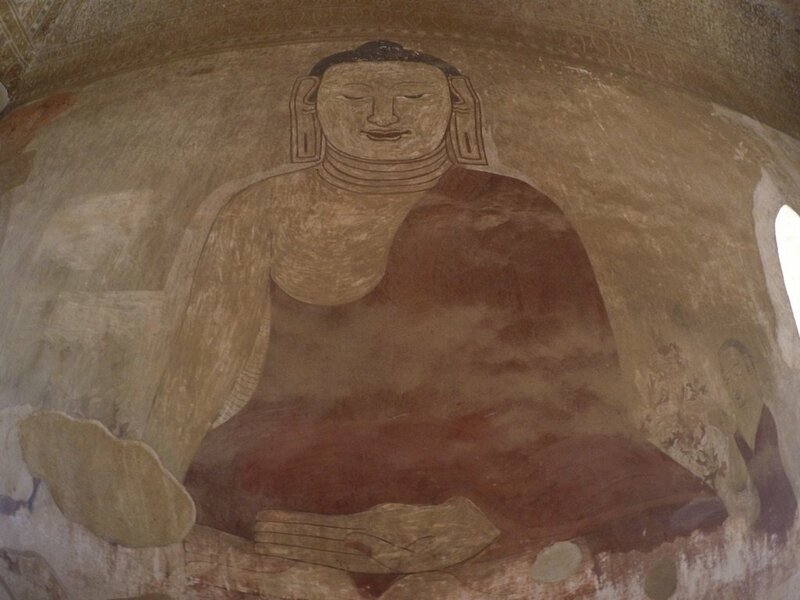 However, the additional tourists should not and do not take away from the incredibly detailed and well-preserved wall frescos. Bring a torch so you can see them all. 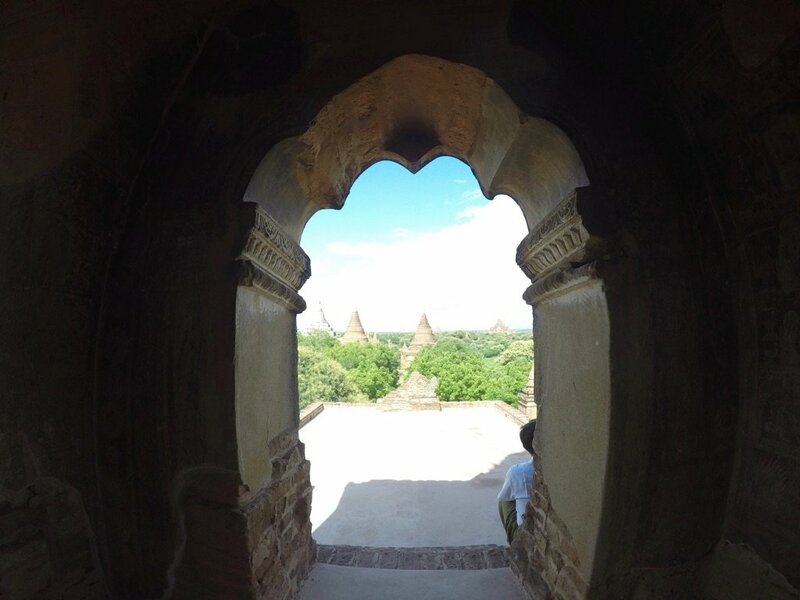 The largest temple in Bagan, built by King Narathu after he killed his father and brother to seize power. It is said he built the temple to atone for his sins. The interior of the temple is bricked up leaving only the outer corridors. 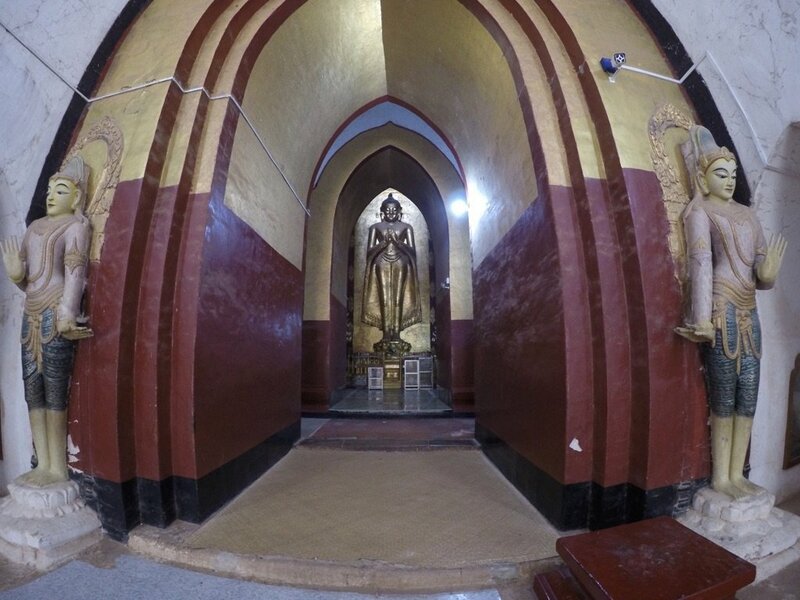 Some say that King Narathu was bricked in alive and now haunts the corridors. The temple is now home to some thousands of bats, who live high in the archways of the outer corridor. 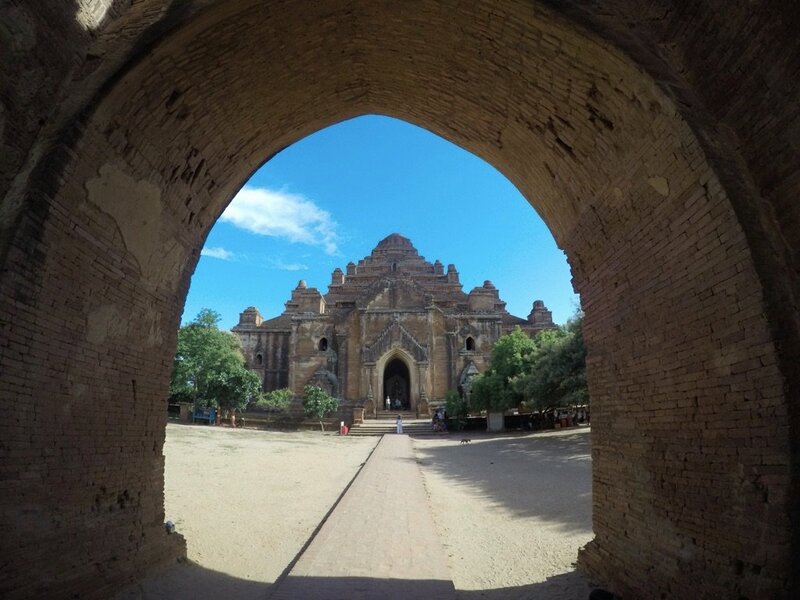 Manuha is one of the oldest temples in Bagan, built in 1067 by the captive Mon King Manuha. 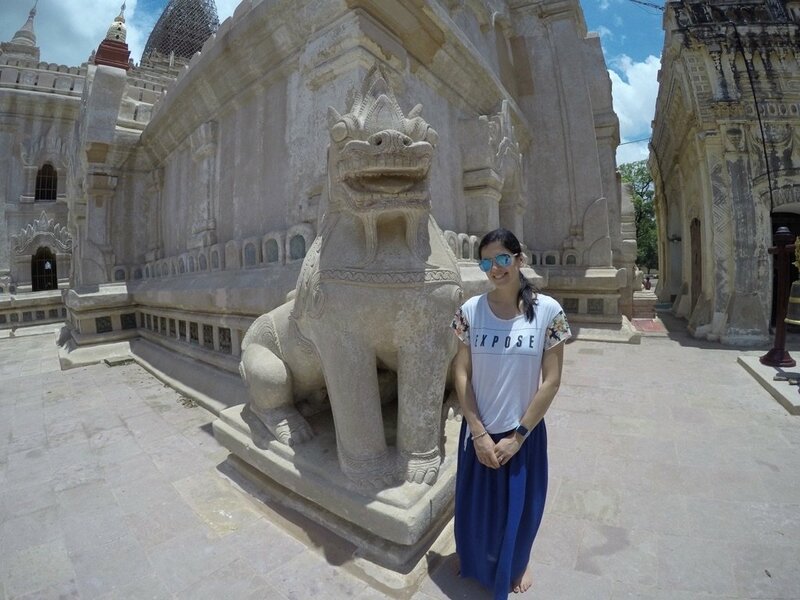 The temple is an interesting one with several giant Buddha statues. What stands out at the temple is the size of the statues, filling up most of the room. It almost feels like you are in one of those fun houses where all the proportions are distorted. 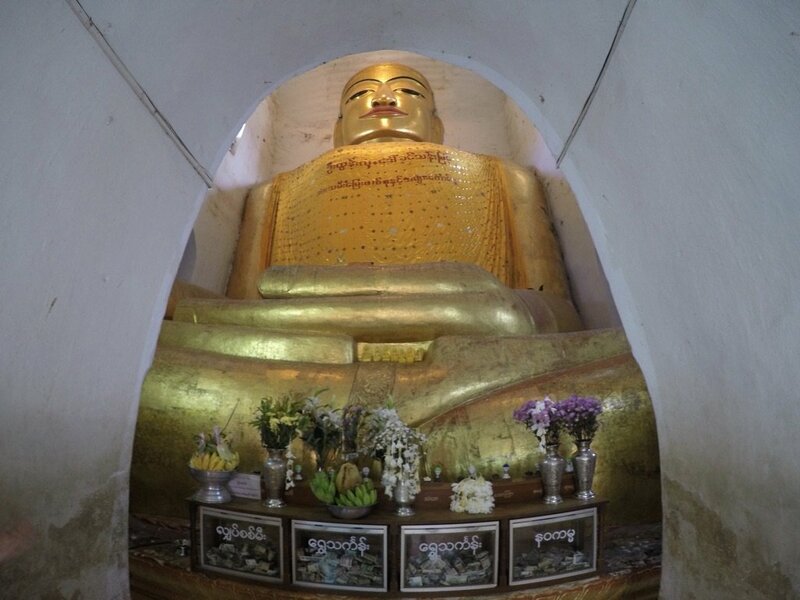 Photo: The reclining Buddha in the Manuha Temple. Close by to the Manuha Temple is the Nanpaya Temple. The small temple was used by the captive Manuha as his living quarters. The real draw is the intricate wall carvings of Brahma and other Hindu gods. As Manuha was a Mon, there are many figures and depictions of the Mon within the temple. Amy and Adam Wright are the husband and wife team behind the travel blog ‘The Wright Route’. Based in the South of England, they offer unique insights in to a range of destinations across the world. Their focus is on active and adventure travel, boutique hotels and luxury dining, but they have been to many backpacker destinations and enjoyed plenty of vibrant street food. They offer practical travel advice and guidance, top tips and recommendations, and rich, vivid imagery and descriptions to accompany their video footage. Join them on their travels to get a fresh perspective on popular destinations, some great insights in to brand new travel ideas, first-hand, down-to-earth advice and a wealth of lucid, colorful storytelling. I loved this post and the pictures! It almost makes me feel like I’m there with the view through the tunnels. I definetly want to be checking this place out in the future! Thanks! 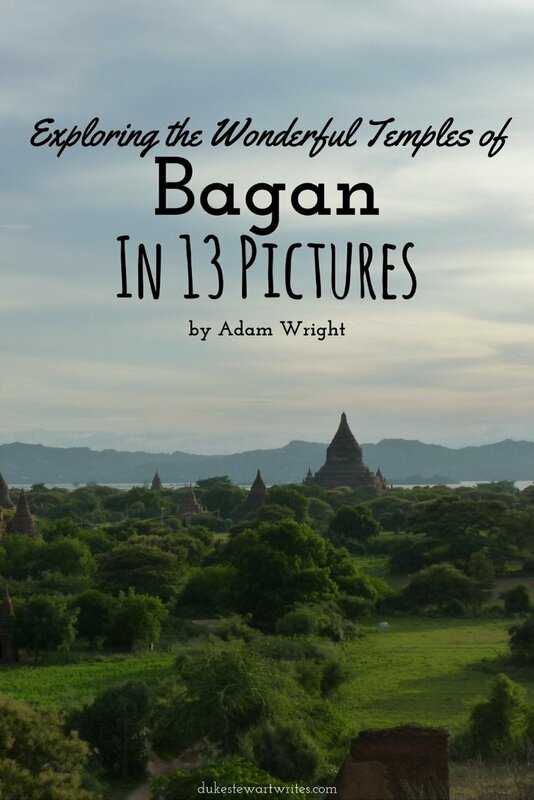 You should definitely visit Bagan. It is such an amazing place!